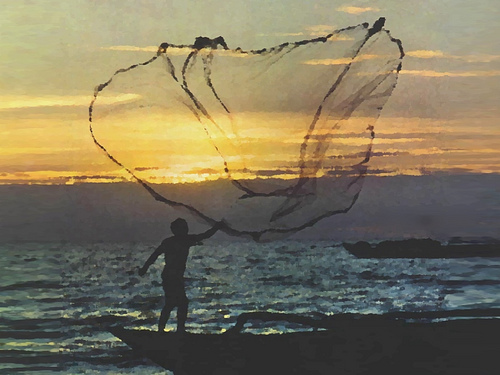 Cast your net on the other side for the draught of fishes, says the LORD. Take Me at My WORD. What you already did in your own strength and with your own abilities and gifts and talents that did not produce anything will not be the result now. With Me you can do all things and have a different result. It is not redundant efforts; it is obedience. Take ME, and take Me at My Word and believe for abundance. Believe for increase. Believe for success in ME. Believe that what I said, I will DO for you, not just through you. I have your best interest at heart and I do no want you wringing your hands in frustration or viewing your labors for Me as a vain thing. DO THEM IN ME and with Me and see that your work shall be rewarding and productive and effective for not only you, but My Kingdom, says the LORD. Your history will not define you. I will rewrite it. I will blow on the dead and dry places of your life that did not reap a harvest and cause life to come. I will rain down upon the desert places of you life with My Spirit and cause them to blossom like a rose. I AM the resurrection and the life, and I will speak to the dead and the dry and the hopeless and the lost and the forgotten and say, “LIVE! Stand tall! Breathe in My Life! Produce! Forgotten dreams will come true as I bring life to them. Past hopes that you have discarded will come to surface as I bring them into being. I will find and save that which is lost and revive and bring new life. I will restore you and bring restoration in your life, ministry, family and to what you deemed as beyond hope. I will do it for I Am faithful and I declare that your labors in Me are not lost, not unproductive and not forgotten. I will give a bountiful harvest and you will forget about the former disappointments and failures of the past for the joy that I give you as you sing the songs of the reaper and gather the harvest that is great, says the LORD. Totally receive an accept the word of God on my birthday today God’s blessings and favor Amen thank God for the blessing he sends my way.